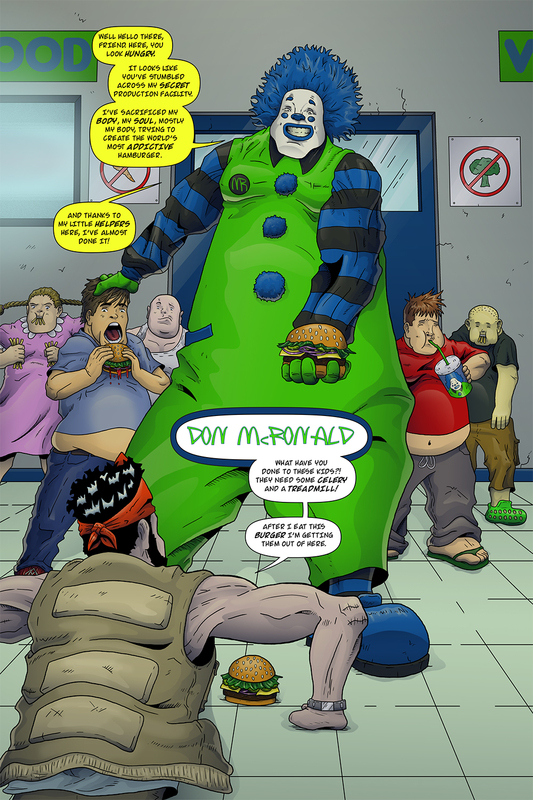 The big reveal of Don McRonald is here! This was a shot that I wanted to set up since I started writing the script as I loved the idea of the villain of the issue offering V-Scope a burger. I tried to push the perspective as much as I could while still making sure I could fit V-Scope, Don McRonald and his army of children in the shot. I’ve just gotten back from the Edmonton Expo and it was a ton of fun. Sabrina and I got to spend 3 days in Edmonton spreading the good word about Team Stryker. I got to see some fans from last year and I hopefully made some new ones as well. Getting to interact with people and hear their thoughts on Team Stryker is one of the best parts of making it. It can be a solemn experience spending 7-8 months by yourself making a comic, so getting to talk to people about it makes it all worth it. For all my new fans be sure to follow Team Stryker on Facebook, Twitter and if you feel like supporting Team Stryker between comic expos you can find me on Patreon as well. Team Stryker will be back next Monday with another burger filled page!